Kilkenny Cooling Systems kitted out the best hotel in the world. The five-star Adare Manor and Golf Resort in Co Limerick was recently named Hotel of the Year 2018 at the Virtuoso Best of the Best Awards in Las Vegas, Nevada USA. Virtuoso is a network of high-end travel agencies with in excess of 17,500 advisers worldwide and a portfolio of almost 1,700 partners, including luxury hotels all over the world. Adare Manor beat off stiff competition from other world class venues such as the Berkeley in London; Grand-Hotel du Cap-Ferrat in St Jean Cap Ferrat, France; One & Only Le Saint Geran in Mauritius, and Royal Mansour in Marrakesh. Adare Manor recently underwent a massive revovation project – one of the largest of its kind in Europe, after bring acquired by JP mcManus in the latter part of 2014. 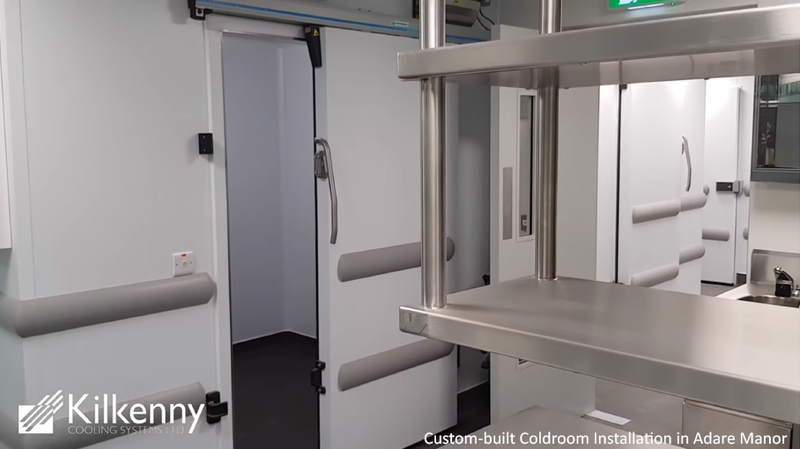 Kilkenny Cooling Systems are national leaders in high end cooling systems installations, so their expertise was called on for the extensive coldroom and beer cooler fit out, which was done to the highest standards. Kitchen coldrooms with hand-made custom stainless steel trims and fittings, and bespoke bumpers were installed, meaning that the project was very much made-to-order. In terms of Beer Cooling, the award-winning Kilkenny VS energy saving beer cooling system was installed. The project for Kilkenny Cooling Systems took place over the course of several months and involved dozens of site meetings and co-ordination with other industry leading organisations in order to achieve the perfect finish on site. For example, the Kitchens were engineered bespoke for this project by Pallux in Germany, and a team of fitters was flown in to perform the installation. “Adare Manor was the largest and most complex coldroom installation project we have ever done. Fulfilling our obligations involved not just extremely high levels of engineering skill and attention to detail, but high levels of flexibility and communication throughout the course of the project.